As part of the final activities lined up for the ceremony, the monarch began his foot procession from his Edaiken Palace in Uselu, Egor Local Government Area of Edo State, to Oredo. It was a very colourful and cultural occasion that was witnessed by hundreds who lined both sides of the streets. This ceremony proved to be what every Bini son and daughter had been waiting for as they all wore infectious smiles and rendered chants of joy as the monarch and his entourage walked across towns and villages showcasing his agility and ability to be the people’s monarch. On the line up to catch a glimpse of this great event were Benin chiefs, traditional groups and societies, women, youth groups, various cultural groups and of course local and foreign tourists. Their joy knew no bounds. The Monarch was escorted throughout by Uselu people on his journey back to Benin City, during which he stopped at a historical palm tree named “Udin ama-mieson aimiuwa” (meaning “work before pleasure”), which the Edaiken “climbs” symbolically. Thereafter, the Uselu chief in the procession took leave of the Edaiken and returned to Uselu while he was escorted into the centre of Benin by Oredo Chiefs, where he stayed for three days to hold private ceremonies. The new king thereafter, picked the title of ‘Oba Ewuare II’ after Oba Ewuare, the first Monarch of the Benin Empire, who reportedly ascended the throne between 1180 and 1300 AD. Ewuare was seen by many as one of the greatest Obas of Benin Kingdom. Ewuare II ascended the throne after his father, Oba Erediauwa, who was born in 1923, to Oba Akenzua II. Oba Erediauwa joined his ancestors in April 2016. A crowd of enthusiastic people later escorted the Oba from Usama Palace to Orho-Okpata in Benin. 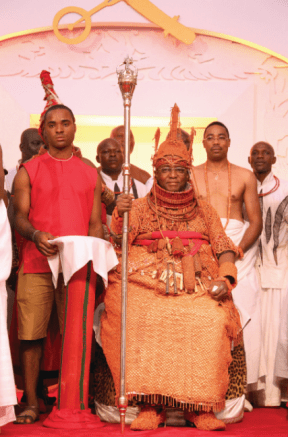 As it is the tradition, the Oba walked through Ore-oghene and stopped by at the Oloto Palace, the home of one of the seven chiefs that usually perform the coronation ceremony at dawn. The Oba thereafter visited a shrine at Iwehen junction to pay homage according to tradition. Then he walked through Ibiwe and later arrived at Urho-Okpota where his coronation was officially performed by Chief Oliha of Benin. The traditional ceremony over, the new Oba was then ready for the statutory presentation of his staff of office which was done within the grounds of the Oba of Benin Palace, located in the ancient city by Edo State Governor, Comrade Adams Oshiomhole. Around to witness this event included Forbes-listed African Richest man, Alhaji Aliko Dangote, Vice President Yemi Osinbajo Ooni of Ife, Oba Adeyeye Ogunwusi; representatives of monarchs from other parts of the world. The Zulu King from South Africa, the Kabaka of the Kingdom of Buganda; the Queen of England, the monarchs of Sweden, Denmark, Norway were all represented by the Ambassadors of their countries. The venue as expected was filled to the brim. All the streets around the Palace were also packed but large screens were mounted all over town to allow the Benin People witness this great and historic occasion. Long may your reign. Oba Ghato Kpere! ….Ise!